Motorcycle Garage is the caretaker of the Lauge Jensen marque and spirit: An enthusiast’s dream of building exclusive motorcycles bearing his own family name. The dream still lives, and the same applies to the faboulous machines – hand-built in limited numbers and to very high standards these machines remain some of the rarest motorcycles in the world. Many young men have dreams and some even look like this. But realizing such dreams is reserved for some very few and very dedicated people, some of which become world-famous like Porsche and Ferrari. Uffe Lauge Jensen did not care about fame: He just wanted to build his motorcycles so exclusive that they were not only the realization of his own dream but also became a little dream for every lucky owner. Getting from dream to reality demanded blood, sweat and tears – as well as time and money. But it did become reality: After several years of development, the first Lauge Jensen was presented in 2008 and the “Great Dane” became the solid foundation on which all further dreams were based. Under the motto “Handmade to Perfection”, each machine then represented individual customers’ ideas about their dream motorcycle. How could this get any better? Well, watch the next step: “Viking Concept” is designed in collaboration with Denmark’s leading automotive designer Henrik Fisker and is based on the solid structure of the Great Dane. The result is a spectacular refinement of the touring genre, a seamless a fusion of classical and modern style. Since this design new EU rules regarding approval and technology of new motorcycles came into force making life quite hard for small manufacturers. By 2015, the founder left the company to pursue new technologies in industries other than vehicle manufacturing, and Motorcycle Garage was founded to take care of the brand. Lauge-Jensen remains a dream for the few – and Motorcycle Garage takes care of these dreams. We service, sell, build and rebuild some of the most exclusive motorcycles ever. We always have a selection of Great Dane and VIKING motorcycles for sale in our showroom in MY GARAGE in Vejle. All our machines are serviced, prepared and 100% ready. 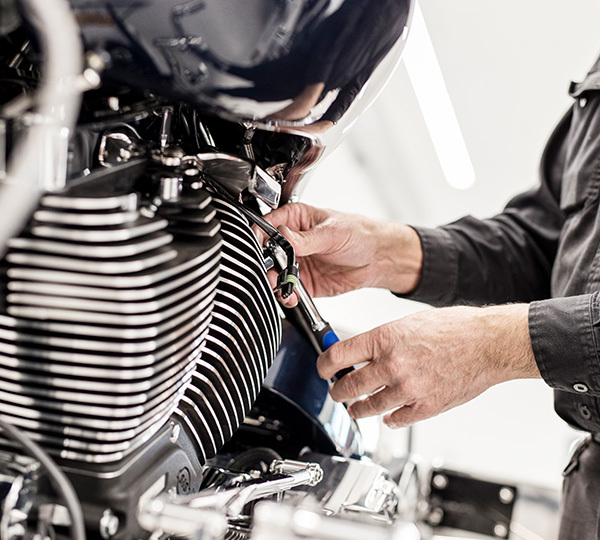 In our workshop at MY GARAGE we are servicing, rebuilding and even continually customizing the motorcycles, and our mechanics’ knowledge about the machines is second to none. After all, they originally built these machines themselves. If you have questions regarding the sale of Great Dane and VIKING, please contact Alexander Wisler.